I love this super tasty lunch for so many reasons... especially that I can taste the health, and feel the benefits after eating it. It is super tasty, very savoury and varied, and the teriyaki sauce in the mackerel gives it a sweet oriental kick. Yes, the mackerel is tinned, and so are the beans, and there's enough beans and mackerel in one tin of each for two or three meals. Add to these two main ingredients a chopped tomato, and some chopped kale flash-fried in a smidgen of coconut butter. 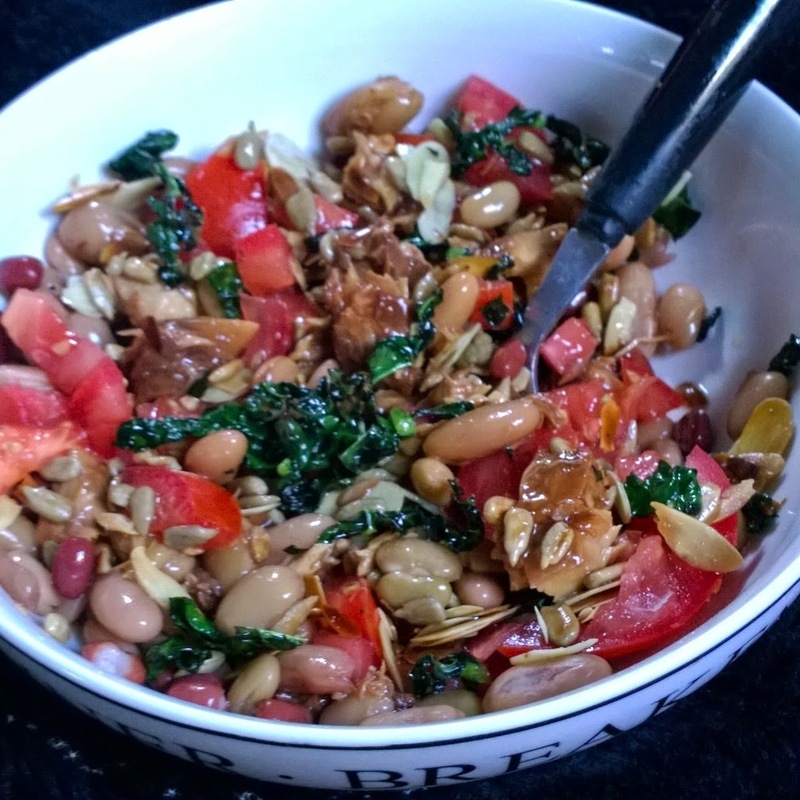 As the kale is almost done, I turn the heat right down and throw into the pan a handful of flaked almonds, and some sunflower seeds. You can let it cool off, or you can just combine the whole lot piping hot from the pan and get stuck in straight away. I need something quick and easy like this when I'm at home beading. I get really hungry, and I don't want to eat unhealthy stodge or empty calories, but neither do I want to break away from working for more than 15 minutes to fix lunch!